But the one we never got. 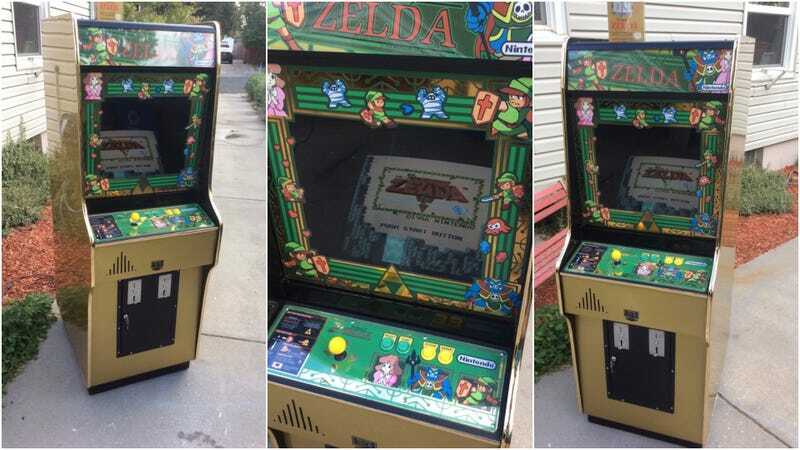 Here’s a spectacular fan-made Legend of Zelda cabinet that shows what could have been, but what wasn’t. Basically, it’s an all wood construction. Primered and block sanded smooth and straight. I painted it with metallic gold automotive urethane, and then added a mid coat of .008 gold flake. After I cleared it, I wetsanded it 1000-3000 and then polished it. It turned out pretty cool. The whole cab shimmers in the light with the light bouncing off the flake. The artwork was a lot of work. I had ro recreate all the images in illustrator. In my design, My intent with the art was to make it look DK/80's nintendo ish. I then hand cut and gold chrome embossed the control panel and bezel. I will do the same with the side art and instruction sticker. Inside, is a decased 20" CRT and an NES wired to the arcade joystick and buttons. I was gonna do a playchoice ten....but now I’m happy I went with the NES. I can play all the NES games with an Everdrive N8. Great job. Just look at it!